There will also be an Amateur Event (for returning and new adult players whom have not been involved in the TFAS Table Football before), WASPA-style Team Open and WASPA Individual Open (Plate) events over the 2 days of competition. With the WORLD 2018 in Russia, all players are requested to select a country to represent. Whenever there are multiple players selecting the same country, a ballot will be conducted More details can be found in the registration form). Table Football (Subbuteo) Singapore is featured on Channel News Asia (CNA) !! Watch it “LIVE” at 30 June 2017 at 7:45am on CNA !! 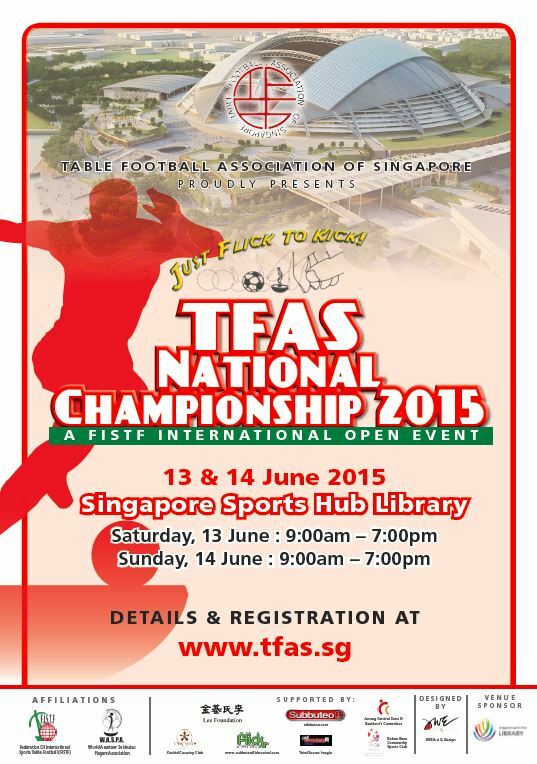 This is an exciting moment for Subbuteo Table Football community in Singapore. Channel News Asia will be featuring Team Singapore’s achievements in the recent Asian Cup 2017 in Japan. Singapore wins Asian Cup in Sports Table Football !! Team Singapore wins the Asian Cup 2017 in Japan !! Tokyo, Japan 10 & 11 June 2017 – Singapore made history by winning the Asian Cup for the 3rd consecutive year. The heroic feat in Tokyo came after similar successes in Melbourne in 2015 and Singapore in 2016. This year’s competition was hosted by Japan at the Adachi City, Tokyo. Three national teams competed in the Nations event, with Australia and Japan finishing second and third respectively. The team event is competed based on the results of four individual matches, with one point awarded for a win. In the Nations event, Singapore defeated Japan 4:0 and Australia 2:1 to win the overall Asian Cup title. Hong Kong, Malaysia and Indonesia, the other Asian countries registered with the FISTF (the world body for sports table football), did not send a team. The team event is competed based on the results of four individual matches, with one point awarded for a win. In the Nations event, Singapore defeated Japan 4:0 and Australia 2:1 to win the overall Asian Cup title. In the Club team event, Singapore’s SG Lions TFC which formed the bulk of this year’s national team took the championship in style by defeating Japan’s Yokohama OSC 4:0 in the final. Singapore’s Tan Kok Wee was crowned Asian Cup Champion in the individual Open category after a nail-biting 2:1 win over Australia’s Raffaele Lombardi. Tan’s victory was particularly gratifying as the individual Open event had attracted highly ranked European players from France, Italy and Wales. Singapore’s team Captain Bernard Lim, made the semi-finals of the Open event and the finals of the Veteran’s event. The weekend in Tokyo also witnessed the establishment of the Confederation of Asian Sports Table Football Association (CASTFA), an Asian chapter of FISTF. The memorandum of undertaking was signed by the Presidents of the national table football association of Japan, Singapore and Australia, and endorsed by FISTF’s Vice President, Steve Dettre. Japan’s Kenzo Koi was appointed the inaugural President of CASTFA after leading a remarkably successful Asian Cup in Tokyo. The CASTFA presidency will be rotated every 2 years. The primary aims of CASTFA are to support the development of sports table football across the Asian region, including promoting and helping form national associations in other Asian countries. CASTFA will also help raise the profile of the Asian Cup and bring it to the next level in terms of prestige and quality of competition. In line with objectives of CASTFA, the TFAS will be stepping up efforts to promote sports table football in Singapore. These will include promotional activities in conjunction with SportSG’s inaugural Singapore Football Week 2017 from 22 to 29 July 2017. Players: Bernard Lim (Captain), Tan Kok Wee, John Ho, Vikas Chandiramani, Ashley Tan, John William Edwards. Players: Bernard Lim (Captain), Tan Kok Wee, John Ho, Ashley Tan, John William Edwards. Come and Join Us … click HERE to contact us.